You know Ma Seok-do must be a tough cop, because he is played by Ma Dong-seok (Don Lee). Ma has ten days to clean out every last member of the Chinese gang from the Garibong-dong neighborhood. Naturally, he will not have any help from the Chinese authorities and precious little from his own Korean police bureaucracy, but he can handle the task anyway with his crushing face-palm. It is time for Ma to take out the trash in Kang Yun-sung’s The Outlaws (trailer here), which screened during the 2018 Fantasia International Film Festival. Ma is not a superman—he has bad knees. Criminals are better off running when they see him, rather trying to go toe-to-toe. In the past, he has informally maintained a truce between the local gangs of Seoul’s Chinatown district, but that went out the window when the savage Black Dragons arrived. Jang Chen doesn’t respect anything except raw power. He came from Harbin to collect debts for his gang and decided to stay to build an empire. Reluctantly, many henchmen from the Venom Gang defected to his syndicate for reasons of self-preservation, but the only people Jang treats with any respect are his two psycho lieutenants. Of course, the merchants and residents of Garibong get the worst of it. Ma will have to convince them to stand with his ragtag unit if he has any chance of rounding up the Black Dragons before the case is kicked upstairs to the pompous homicide squad. Ma Dong-seok beats the snot out of Black Dragons. Seriously, what more do you need to know? There is actually a fair amount of inter-gang rivalry and intrigue, but the film is really about Ma putting his foot in their butts. Frankly, the film is a little slow out of the blocks, but Kang uses that time to establish his many characters and the cowed and depressed atmosphere of Garibong-dong. Of course, when Ma hits the streets, the film is all business. After Train to Busan broke Ma/Lee out in Korea and internationally, The Outlaws and Champion have solidified his status as a crossover action star. In both films, he shows he has the size, chops, and the amiableness to be something like the next vintage Schwarzenegger. Watching him swagger inspires endless confidence in a film. 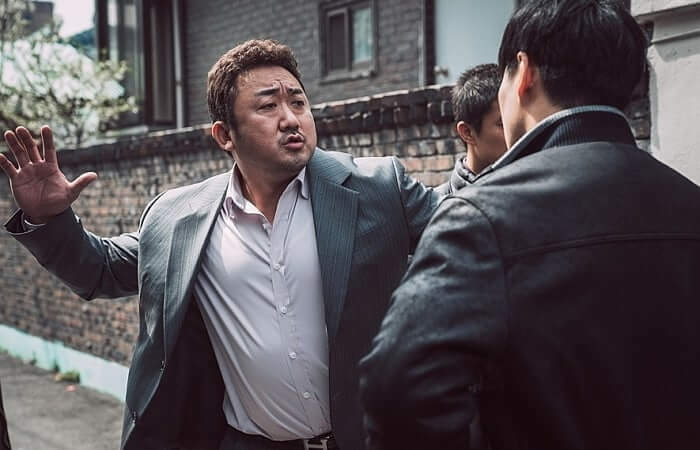 While Ma’s Ma is the drinking buddy you always wanted, Yoon Kye-sang makes Jang Chen one seriously cold-blooded villain. He is the sort of ruthless sociopath the audience will yearn to see crash and burn. Yet, Park Ji-hwan and Jin Seon-kyu manage to periodically upstage him as his chief rival and first lieutenant, each of whom is dangerously erratic. In fact, Ma’s final fight is the sort of scene that will bring a smile to fans’ faces. Ma exerts his body-slamming authority all over the film, but we’re always comfortable in his presence. 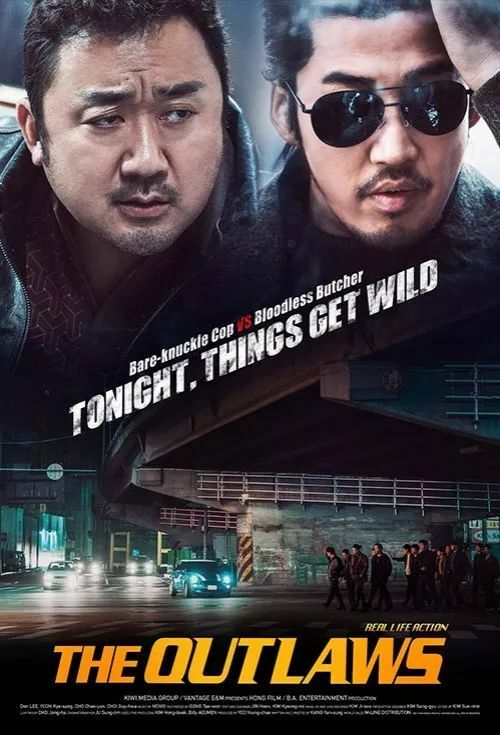 There have been plenty of Korean gangster movies, but Ma is still relatively new to being a leading man and former pop star Yoon also ventures outside his rom-com safety zone—and viewers can pick up on how fresh and energizing it all is for them. Recommended without reservation for fans of Ma and Korean crime films, The Outlaws had its Quebec premiere during this year’s Fantasia.